First, before you buy your fabric you are going to need 2 measurements. The first is a waist measurement, in my case I need 20 inches. Then take a length measurement,in my case 10 inches (waist to knee measurement). I made this particular skirt for a 2 year old. Now to know how much fabric to buy…..double the waist measurement. Mine will be 40 inches. Add 2 inches to the length measurement. Mine will be 12. Tulle- 3 yards for 2 and under, 3 1/2 for size 3-5. Turn top edge of skirt and iron 1 1/4 inches down. DO NOT SEW YET. You need it as a guide for your ruffles. Your skirt should now look like this. Sew 4 peices of tulle together to get one LONNNNGGGG ruffle. Do not backstitch. This will be the first tier. Repeat until you have all 3 (or 4) done. Don’t worry about these seams, they do show in the skirt, but we will pull them out later. Get ready to ruffle. Set your tension on your machine to the highest it goes. In my case 9. Put your stitch length on the longest it goes. 5, in my case. Fold tulle in half (you want a three inch ruffle) and sew down the middle. The machine will do all of your ruffling for you. Magic, I tell you. Magic. Continue ruffling the other 2 (or 3) tiers. Turn your skirt over…the ironed edge should be underneath…and begin pinning the ruffles onto the skirt. I usually start with the top and line up the top ruffle with the bottom of the iron-edge (the elastic casing). Repeat with other layers until you have something that looks like this. Sew each of the layers onto the skirt layer, following the same lines as the ruffling. Ok. Take a break. Get some chocolate. Ready again? Unfold the ironed edge and put the skirt right sides together to sew the side seam. (Make sure that the tulle is tucked in well on the front….from experience). Sew the side seam. It should now look like this. Refold the ironed edge. This will be the casing for your elastic, and sew. You will want a small opening to thread the elastic through. *Again,from experience, make sure that the tulle is NOT getting caught under this seam….go slow and push it down underneath with your hand. Here’s where you are going to pull out your vertical seams. You don’t have to but they do show through the tulle a bit, and it will make your skirt look more professional and less homemade. It’s not showing up super well in the picture but you understand. Pull out these vertical threads that once held the tulle together. It’s worth the time, I promise. Now it’s time to measure your elastic, which will be 2 inches smaller than your waist measurement and cut. Thread through your casing (I use a giant safety pin). Stitch ends of elastic together and then stitch up your casing as well. AND YOU’RE DONE! Hip hip hooray! Yahoo! Celebrate!!! And take a picture. We would LOVE to see your skirts. This is sooo cute. I can’t believe you made this skirt for $5!!! Thanks for sharing how to make it. AWSOME!!!!!!!!!!! Soo cool-I will have to do this asap! So cute! I love the color and all the ruffles :). Beautiful! 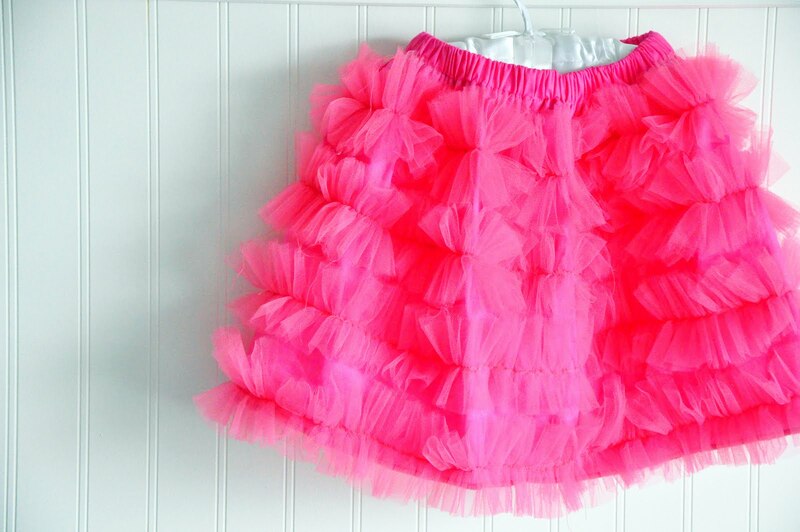 Do you think you could make the ruffles using tulle ribbon… the kind that comes in 6″ spools? I did make some later ones with the tulle spools (a black one and a white one. I couldn’t find the right color pink which is why I did the bolts of tulle for those for a wedding last summer. I would totally recommend the spools though, I just folded them in half (to a 3 inch ruffle) and they worked perfectly….and it is was much easier. what kind of fabric did you use? I just just regular broadcloth for the underneath skirt and tulle in the same color for the top skirt. I love what you have done, the hot pink is a great colour choice too! Not sure if you will see this…but question: how long are your tulle pieces when its all put together. I have some of the spools of tulle and want to try this skirt!! 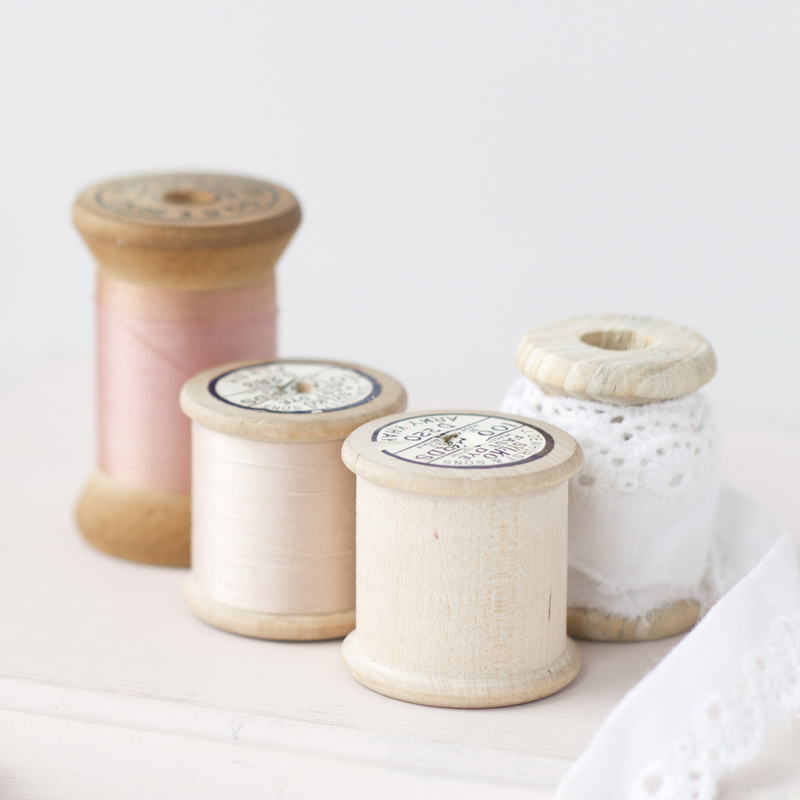 Do you use 3 spools–an entire spool for each line of tulle? or does it not need to be that long? I’m so excited, it looks so cute! absolutely, that way you wouldn’t have to cut it.